Do you remember the last time I did my nails at Shining Nails? Shining have never never failed to do an awesome job to my nails! SHINING IS ALSO A KITTY FAN! or Kitty's nose will be too small/big if you do them at certain nail salons.. These problems will not happen with Shining as she's a Kitty fan like anyone of you! Awesome right? It looks just like the "real" one! & now lets look at some other designs she've done that you and I can relate to! Price for my readers: SGD20+SGD32(gel)=SGD52-10%=SGD46.80! Price for my readers: SGD26+SGD32(gel)=SGD58-10%=SGD52.20! & prices for designs are stated on the designs (pictures) themselves. just let her know and she will quote you accordingly! Quote "KiyomiLim" to get 10% off your total bill with Shining! 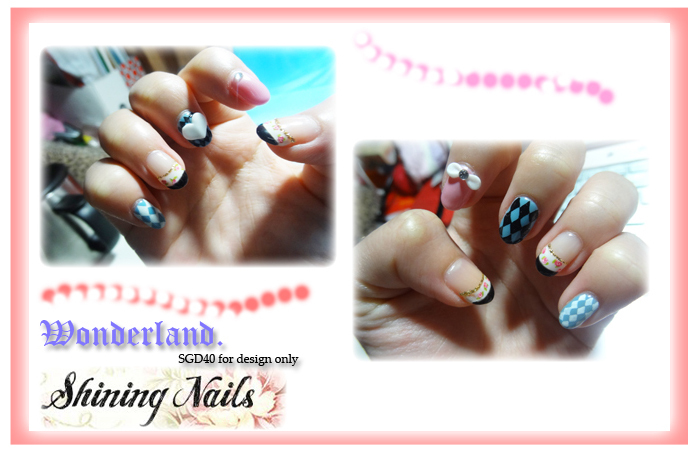 It's will be SGD40(design)+32(gel mani)=72.